While iOS 9.3 has several new features and is a notable improvement over prior iOS 9.x releases, some users may wish to downgrade iOS 9.3 back to iOS 9.2.1 for whatever reason. Downgrading to the prior release is possible for a limited time, so if you have any interest in doing this you’ll want to move quickly before Apple closes the signing window for the earlier firmware version. To be perfectly clear, downgrading is not recommended, particularly since iOS 9.3 is an improvement over iOS 9.2.1, with better performance, better security, and new features, thus you should only downgrade from iOS 9.3 if you have a very specific reason to want to return to iOS 9.2.1. You can be the judge of that, but we are not recommending this process, this is simply demonstrating that it is possible. Downgrading firmware is the same process on any device (iPhone, iPad, iPod touch) with iTunes, on either a Mac or PC. Once the downgrade from iOS 9.3 back down to iOS 9.2.1 is completed, the hardware will reboot as usual and it’s ready to be setup. 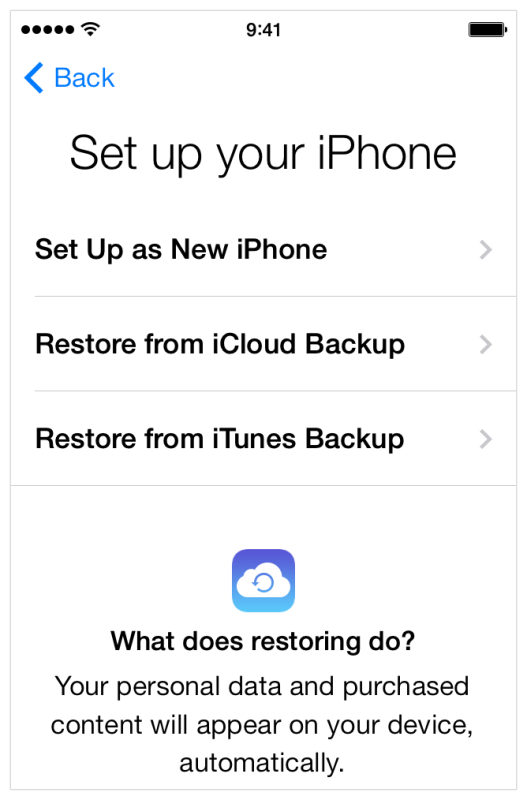 You can now choose to either set it up as new, or restore it from a previously made backup. Why downgrade? For most users, you should not downgrade. This is really only intended for persistent problems that may arise in unique situations as a troubleshooting method, or if for some reason a critical app is not working with iOS 9.3 but it worked fine with iOS 9.2.1 and the user can’t wait for the app to be upgraded to resolve the crashing app issue (since app updates and iOS updates almost always remedy those type of software problems). The other reason to downgrade is if for some reason you don’t like the newest version, which is fairly unlikely with iOS 9.3 given that it has better performance and a few new features – what’s not to like in that situation? Finally, keep in mind downgrading is only possible for a limited time while Apple signs the old iOS version, whereas upgrading is always possible. Thus, even if you downgrade to iOS 9.2.1, you can update to iOS 9.3 again at any time in the future. iOS 9.3 seems to be snappier and, since FINALLY its Podcast app has been fixed – iOS 9 dropped the ability to watch video in fullscreen mode – I’m interested to know why someone should downgrade. If, like me, you owned an ipad 2 that is a paperweight after upgrading to iOS 9.3 because you can’t activate it, you’d also want to downgrade. Did the downgrade work ? What did you downgrade to ? My paperweight has the same problem and it’s driving me mad, advice seams to vary in relation to what to downgrade to. Have never had to do anything like this before so a bit nervous I might mess up ! I downgraded due to ios9.3 been buggy (safari and chrome browsers no longer work correctly(there appears to be a url handling fault in the 9.3 update)). @Alex – the reason is that since upgrading to 9.3 on my 6+, links don’t work on Safari. This has happened to most people who has upgraded with certain phones. Therefore we are trying to find a way round our broken phones in the absence of a fixed iOS from Apple. They released a ‘brilliant’ new iOS without testing it properly. Hopefully this answers your question. This step-by-step guidance saved my life. After installing ios 9.3, my iBooks kept crashing. I did everything possible but to of no avail. I have got about 2000 books of which 50% is in PDF, and i used iPad mainly for carrying my library and reading it at my leisure time. Phew! after downgrading, I can use my iBooks once again. Whoever is following this step, please do not forget to take backup via iTunes, and second, you need to download the earlier ios file and save it in your PC. The only reason one would downgrade would be if your are waiting for a Jailbreak- 9.2 and 9.2.1 may come first. I need to downgrade because mail and safari links do not work. My iPhone 5 using MetroPCS can’t connected to cellular data using 9.3. I have confirmed this by downgrading to 9.2.1, and in the process, wiping the phone, at that point I have cellular data connectivity. Then on the pristine phone, upgrading to 9.3, at which point, I lose cellular data connectivity. I still have voice, and it reports connecting the LTE at the top of the phone, but data doesn’t get through. So I had to fix by downgrading, which is irritating, because I am getting constant notices to upgrade. Thanks for posting this! Really needed to go back to iOS 9.2.1! how can i update software if there is no WiFi connection. i have postponed to update software and now my WiFi option not working. i have to update the software in order to active WiFi. please some one help me in this regards. Grrrrr … Why does a “.” upgrade install significant changes (enforcing iCloud symmetry across shared devices for us truly, lovingly married folks). Just got through finding out that the Weather app now enforces identical locations across our devices when we have different one for each of us. Apple, let us decide, and not force us to have separate iCloud ids. is this to increase your user count? Bleccch!! This would have been very handy, as iOS 9.3 has broken Safari, weblinks from email, and some links in Chrome (using iPhone)… BUT… option 7 appears impossible on latest version of iTunes. Restore iPhone will only restore the current version of iOS. You have to ALT/Option+click the Restore button and select the iOS 9.2.1 IPSW file on a Mac with iTunes. In Windows it’s Control or ALT or something, it is shown in the article which button to press for Windows users. This works to downgrade from iOS 9.3 to iOS 9.2.1, I have done it. Some of the link issues continue in iOS 9.2.1 mysteriously, but it doesn’t crash or freeze at least. I may need to downgrade. iBooks does not work at all with 9.3. Too many bugs in both, iphone 6 plus and Ipad air 2 in the ibooks app. Any idea why mine says 9.2.1 is the current software still? Looking for help with this. I have an iphone 5C that has a broken screen/digitizer (vertical lines on the right side of the screen and no response to touch) that is updated to 9.3. I have an SE on order that will arrive on Thursday. In the interim I am using a borrowed 5S that has 9.2.1. My only current iTunes backup is from 9.3 and it won’t allow me to use this to restore to 9.2.1. It seems that 9.3 has been pulled so I can’t easily update the 5S to 9.3. I have downloaded the ipsw file and get an error 3194 when trying to restore. Any ideas? How do you delete 9.3 if it was downloaded but not installed on 4S? Keep getting a message unable to verify so maybe better to delete and wait for next release?? I upgraded a few days ago everything worked fine and now Wi-Fi does NOT WORK!!! Come on apple — I am NEW to Apple (iPhone 6s Plus 128gig) and iMac — I was an android user since my first smart phone of so many years ago and was always a windows person. Same problem here on my iPad Mini 3. Wifi signal keeps dropping since 9.3 install. Went up to 9.3.1 and the problem is still there. I’m going to go back to 9.2.1 and see if that corrects the issue. Very frustrating. This is the first iPad problem I’ve had in over a year of use. I went Mac because I really thought Apple was better than Microsoft about not releasing buggy software but apparently that’s not the case. BETA TESTING, Apple!!! It’s your friend. Downloaded IOS 9.3 & Safari doesnt sök. Cant Google and some other apps dö NOT WORK!! FIX THIS APPLE ASAP!! I NEED MY IPHONE. YOU ALWAYS F UP!! DONT UNDERSTAND HOW TO DO THAT. APPLE SHOULD HAVE A REGRET BUTTON!! This is ridiculous! Really? I can’t even access the Internet to check on updates to repair the bugs in iOS 9.3 using my iPhone 6plus because safari and Google don’t work! And now I’m copping I from my android friends…you love to put crap on Apple! You would think Apple would put information on the iOS 9.3 issues on some where internationally accessible that could be viewed by customers – you know possible like a website! Possible even their own? I guess you need for this an “old” backup file of iOS 9.2.1. After following the instructions I get the message in iTunes that my iPad Air 2 can’t be restored from the iTunes file because the software on the iPad (iOS 9.2.1?) is too old. Faffifournik, same issue for me. Now trying to restore it from Another computer that I also sync with but do not think it will work either. I just have to hope that downgradning to 9.2.1 and then upgrading to 9.3 solves the issue. DO NOT USE THIS PROCEDURE BECAUSE IT DOES NOT WORK. When you backup from 9.3 you can only restore to 9.3. After downgrading to 9.2.1 you’ll just have to upgrade back to 9.3 in order to restore your data. Wasted a lot of time. You didn’t read the article. This works to downgrade iOS 9.3 to iOS 9.2.1. I did it. 1. Works if you don’t mind losing all your data and configuration. Maybe that works for you – it doesn’t for me. 2. The article doesn’t specifically say that anywhere. Step 1 is to make a backup, which makes a 9.3 backup which is then unusable on 9.2.1. Since that backup is unusable, what’s the point of making it? The article should clearly state that this procedure ONLY works with old backups (which are typically useless due to the fact that they’re OLD backups). 3. Setup as new is useless (see #1). There is no other method available currently, but Apple will release iOS 9.3.1 to fix the problem sometime, but nobody knows when. I must agree with other comments on this article. The writer leaves out a very important comment on restoring a backup. You can only restore an older backup that was created when you had iOS9.2.1 on your device, an later backups created with iOS9.3 will refuse to restore stating that the iOS is too old. This is an important thing to consider before you go down the route of downgrading your iOS. The only reason I’ve upgraded was because I had no choice I had to take it in to the Apple Store and because it was jail broken I had to restore so I won’t lose my warranty. Now if I upgrade I always wait for at least a month to read all those blogs and see if there are problems with the new iOS, I don’t run to upgrade just because Apple tells me to. The thing is that I got none of the bugs that are discussed here and all I can think of why is because and this is a maybe I use an older iTunes ( which I used to do the upgrade ), one thing for sure NEVER upgrade OTA ( over the air using WiFi ) it’s already been proven that you don’t get the same results, like if you want to jailbreak your iOS had to be installed by using iTunes or if the jailbreak will work it will have bugs, now I’m not saying jailbreak or if it’s good or not I’m just proving that upgrading with iTunes is different then upgrading over the Air, and now it’s time for me to downgrade just in case that the next jailbreak will be for iOS 9.2.1 and if it will be for iOS 9.3.X then I’ll always be able to upgrade again. One last thing, iOS 9.3.1 just came out so instead of downgrading, upgrade unless you like jail breaking like me. How can they get away with this ? Another upgrade came through on the 2nd. Thought this would fix it but no ! Can’t go to comment or view on Facebook. U tube works. 2 emails not working ??? What to do eh ? Just wait is it ? Ps. What does jail breaking mean? Since i have updated my phine to ios 9.3 i am not able to use it, it is asking about my icould id to login but the id that it is showing is incorrect. my ID s******@icloud.com (7 characters) but it is showing s*****@icloud.com (6 characters) which is not correct. i have log in with my ID on web browser or in itune but not able to login to my iphone. it is headache now for me. is there any way that i can reset or downgrade to ios 9.2. i also gave it to my region iphone dealer and they have no idea what to do.